This research sets out to conduct a baseline study on personality traits of student teachers to assess the possible implications for an optimal person-environment fit or unfortunate misfit. A non-experimental quantitative research design was used and data were obtained by administering the NEO Five-Factor Inventory (NEO-FFI) to 835 student teachers at the North-West University in South Africa. Data were analysed using descriptive and inferential statistics. Results indicated a much lower than expected score on agreeableness and a much higher than expected score on neuroticism. The only desirable personality trait presented in the specific sample was extraversion. The undesirable scores in the four personality traits are discussed in terms of the potential implications of a misfit between student teachers and the teaching environment; and of the sole desirable personality trait in terms of an optimal person-environment fit. Gender differences were noted in the personality domain agreeableness. Future research is indicated to determine the usefulness of personality assessment in the selection of student teachers in other teacher training contexts. The NEO-FFI shows promise in this regard. The Department of Basic Education in South Africa (2014) holds that every child is a national asset. This value statement is underpinned by the notion that investment in children's education can contribute to the development of lifelong learners, and an improved quality of life for society in general. Key to this vision is quality education, informed by the values of excellence and innovation (Department of Basic Education, Republic of South Africa, 2014). Excellence refers to maintaining high standards of performance and professionalism, while innovation refers to specific ways of achieving these standards (Department of Basic Education, Republic of South Africa, 2014). Delivering quality education is an important drive, both nationally and internationally (Organisation for Economic Cooperation and Development [OECD], 2013; Spaull, 2013), but in South Africa it is crucial, due to limited economic resources and the need to be globally competitive (National Planning Commission, Republic of South Africa, 2012). Society also has high expectations of teachers. Following the Minimum Requirements for Teacher Education Qualifications (MRTEQ) (Department of Higher Education and Training, Republic of South Africa, 2015), teachers have to master seven roles to be regarded as effective in the South African education context. They are expected to be: (1) a specialist in a phase, subject discipline or practice; (2) a learning mediator; (3) an interpreter and designer of learning programmes and materials; (4) a leader, administrator and manager; (5) a scholar, researcher and lifelong learner; and (6) an assessor. In the final instance (7), teachers are also expected to fulfil a community, citizenship and pastoral role (Department of Higher Education and Training, Republic of South Africa, 2015). Literature further confirms that teachers are the most important in-school factor influencing the success of learners (Nye, Konstantopoulos & Hedges, 2004; Rivkin, Hanushek & Kain, 2005; Rockoff, 2004). However, over the past 10 years, educational systems globally and in South Africa have been subjected to change with profound implications for teachers (Aaron & Du Plessis, 2014; Dlamini, Okeke & Mammen, 2014; Khumalo, 2015; Köysüren & Deryakulu, 2017; Mohapi, Magano, Mathipe, Matlabe & Mapotse, 2014). Teachers have had to adjust to a learning philosophy that altered previous practice from unidirectional to co-constructed learning environments (Aldridge, Fraser & Sebela, 2004; Alexander & Van Wyk, 2014). Apart from their educational responsibilities, teachers are also often the first ports of call to deal, for example, with interpersonal violence, neglect, abuse, teenage pregnancy, starvation, child-headed households, and the impact of Human Immunodeficiency Virus (HIV) and Acquired Immunodeficiency Syndrome (AIDS) (Matoti, 2010; Oswald & Perold, 2015). A further observation is that not all those who want to become teachers are equally capable of being effective in their role (Leigh, 2010), raising the question whether good teachers are born or made (Wiens & Ruday, 2014). It should therefore come as no surprise that teaching ranks among the most stressful professions worldwide (Aamir, Ullah, Habib & Shah, 2010; Leung, Chiang, Chui, Lee & Mak, 2011). In South Africa, too, stress is a major cause of teachers' leaving the teaching profession (Crafford & Viljoen, 2013; Hopkins, 2014; Jackson & Rothmann, 2006; Milner & Khoza, 2008; Olivier & Venter, 2003; Paulse, 2005). Following the discussion above, it seems reasonable to examine how student teachers are selected to fit an educational environment. An optimal person-environment fit recognises that a particular work environment involves unique demands and challenges, and requires a compatible individual with traits or characteristics that could meet these (Etzel & Nagy, 2016; Kaub, Karbach, Spinath & Brünken, 2016). A person-environment fit assumes that differences exist between individuals and environments and that matching individuals and environments could increase the likelihood of positive outcomes (Chuang, Shen & Judge, 2016; Pawlowska, Westerman, Bergman & Huelsman, 2014). Literature would appear to pay little attention to personality assessments for student teachers to promote an optimal person-educational fit (Barrett, 1991; Leigh, 2010; Rockoff, Jacob, Kane & Staiger, 2008; Wiens & Ruday, 2014). Research also fails to draw clear connections between personality and teaching performance (Rockoff et al., 2008), while only a few studies have linked personality to effective teaching (Barrett, 1991). Thus far, prospective student teachers have been selected according to their academic achievements (Arif, Rashid, Tahira & Akhter, 2012; Wiens & Ruday, 2014). 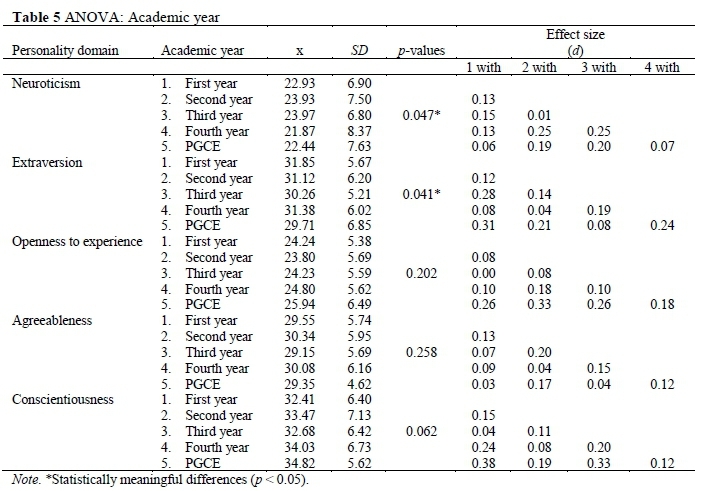 The assumption in this research is that if specific personality traits can be identified to predict teacher effectiveness in a reliable manner, a more optimal fit is likely to contribute to a greater retention rate of teachers, and the optimal use of valuable training resources and the achievement of quality education for every child in South Africa. This research is informed by the notion that the status quo of personality traits of student teachers should be established before selection criteria are changed (Jamil, Downer & Pianta, 2012; Ripski, LoCasale-Crouch & Decker, 2011; Robbins, Fraley, Roberts & Trzesniewski, 2001; Wiens & Ruday, 2014). In determining what needs to be done to promote an optimal personenvironment fit, the question guiding this research was as follows: what personality traits are present in a baseline study of a group of student teachers? Definitions of personality emphasises different aspects. For example, in the earlier writings, personality was regarded as encompassing those stable traits and habits in a person that are relevant or predictable to other people, in relation to those requirements of the social environment that call for adaptation (Byrne, 1974; Cattell, 1950; McClelland, 1951; Mischel, 1976; Pervin, 1975). Sullivan (1953) highlighted the repetitive nature of behavioural patterns in addition to the contribution of Allport (1961), who regarded the dynamic psycho-physiological systems as responsible for individuals' typical behaviour and thoughts. Eysenck (1975) regarded personality (viz. temperament and intellect) as being observable physical characteristics of body shapes. Informed by these different perspectives, personality, for the purpose of this research, is regarded as an intra-psychic construct consisting of an integrated and dynamic organisation of an individual's psychological, social, moral and physical characteristics, determined by the reciprocal interaction with the social environment. The approach to determining the variables associated with the personality structure of an individual is referred to as trait theory (Chamorro-Premuzic, 2014; Derlega, Winstead & Jones, 2005; Feist, Feist & Roberts, 2013). In order to understand this theory, the lexical hypothesis and factor analysis need to be explained. In the lexical hypothesis, the number of variables associated with the personality structure of individuals is reduced and encoded in the natural language of individuals (Derlega et al., 2005). Allport and Odbert (1936) were among the first theorists to identify a list of 18,000 words describing personality from two of the most detailed and comprehensive dictionaries available at the time, which they later reduced to 4,500 adjectives. By identifying synonyms and antonyms, Cattell (1957, 1970) further reduced the list to 171 words (Chamorro-Premuzic, 2014). Factor analysis identified 16 personality factors, which Eysenck (1975) reduced to three, and which Costa and McCrae (1985, 1989, 1992), and McCrae and Costa (2010) reduced to five. Currently, most personality theorists view these personality factors as the Big Five Model of Personality, consisting of: neuroticism, extraversion, openness to experience, agreeableness, and conscientiousness. Neuroticism (N) refers to a general tendency to experience negative affect, such as fear, sadness, embarrassment, anger, guilt and disgust. Extraversion (E) refers to liking people and preferring large groups and gatherings, but also to being assertive, active and talkative. Openness to experience (O) represents the tendency to engage in intellectual activities and experience new sensations and ideas. Agreeableness (A) refers to friendly, considerate and modest behaviour accompanied by a tendency to friendliness and nurturance. Conscientiousness (C) is associated with proactivity, responsibility and self-discipline and encompasses competence, order, dutifulness, achievement-striving, and deliberation (Costa & McCrae, 1989, 1992; McCrae & Costa, 2010). A summary of the five personality factors with low and high scores and with a desirable score for student teachers is presented in Table 1. Desirable scores have been identified by referring to literature to identify specific demands and challenges of learning environments, and by taking into consideration the developmental needs of learners across the lifespan, from pre-school to Grade 12 (Landsberg, Krüger & Swart, 2011; Louw & Louw, 2007). Based on the Big Five Model of Personality, Costa and McCrae (1989, 1992) and McCrae and Costa (2010) developed the NEO-FFI as an instrument to assess personality. The aim of this research is to obtain a baseline assessment of student teachers' personalities using the NEO-FFI. In this study, a non-experimental quantitative research design was followed. The research design may be regarded as structured, predetermined, formal and specific (Creswell, 2014; McMillan & Schumacher, 2014). This research design is grounded in a post-positivistic framework, which requires the researcher to take a distanced overview and to have the ability to see the whole picture, with the aim to create new knowledge focused on changing the world and contributing towards social justice (Mertens, 2015). Applied to this study it means that certain personality traits would predict a better person-environment fit between student teachers and the educational context in which they might ultimately function. A convenience study population of full-time student teachers at the North-West University in South Africa was used for this baseline study (Creswell, 2014; McMillan & Schumacher, 2014). The study population included male and female student teachers in their first, second, third and fourth years of study, who registered for degrees in the Foundation, Intermediate or Senior and Further Education and Training, as well as Post-Graduate Certificate in Education (PGCE). The rationale was to include all prospective teachers at the university as part of the study population. Given that personality is a universal construct, race was not included as a biographical variable. The NEO-FFI (Costa & McCrae, 1989, 1992; McCrae & Costa, 2010), a standardised personality questionnaire, was used as the assessment instrument during the process of data collection. The NEO-FFI, an instrument that measures the Big Five Model of Personality, namely neuroticism, extraversion, openness to experience, agreeableness and conscientiousness, consists of 60 items in a five-point Likert scale ranging from 1 (completely disagree) to 5 (completely agree), which takes approximately 15 minutes to complete. The NEO-FFI is cross-culturally stable as has been clearly demonstrated by the number of languages and culturally diverse contexts in which translated and adapted versions have been applied successfully (Aluja, García, Rossier & García, 2005; Lucas & Donnellan, 2009), including Africa (Rossier, Dahourou & McCrae, 2005), and South Africa (Anthony, Clarke & Anderson, 2000; Heuchert, Parker, Stumpf & Myburgh, 2000; Zhang & Akande, 2002). In this regard, McCrae, Terracciano and 78 members of the Personality Profiles of Cultures Project (2005), as well as McCrae, Terracciano and 79 members of the Personality Profiles of Cultures Project (2005), indicate that the Five-Factor Model of Personality has been empirically validated among more than 50 cultures representing six continents. This bears testament to the universally applicable nature of this conceptualised measure of personality. According to these empirical validations, test-retest reliability coefficients for extraversion, neuroticism and openness to experience ranged from 0.68 to 0.83 over six years, and from 0.63 to 0.79 for agreeableness and conscientiousness over three years (McCrae, Terracciano & 78 members of the Personality Profiles of Cultures Project, 2005; McCrae, Terracciano & 79 members of the Personality Profiles of Cultures Project, 2005). Despite the fact that the NEO-FFI is a standardised psychometric instrument (Costa & McCrae, 1989, 1992; McCrae & Costa, 2010), confirmatory factor analysis (Field, 2013) and structural equation modelling (Arbuckle, 2014) were employed in this study to confirm its construct validity. The confirmatory factor analysis and structural equation modelling both concluded that all items contained in the NEO-FFI loaded on the same personality domains, as reported by Costa and McCrae (1989, 1992) and McCrae and Costa (2010) in accordance with the NEO-FFI manual. Moreover, it is helpful in the context of this study that findings from Zecca, Verardi, Antonietti, Dahourou, Adjahouisso, Ah-Kion, Amoussou-Yeye, Barry, Bhowon, Bouatta, Dougoumalé Cissé, Mbodji, Meyer de Stadelhofen, Minga Minga, Tseung, Romdhane, Ondongo, Rigozzi, Sfayhi, Tsokini and Rossier (2013) who, using the same methods, conducted a similar study among 1,774 participants from four African regions, and arrived at the same conclusions as those reported here. A substantial correlation was found between the calculated Cronbach's Alpha coefficients (Cronbach, 1951) and those reported in the NEO-FFI manual (Costa & McCrae, 1989, 1992; McCrae & Costa, 2010), namely 0.70 as opposed to 0.77 for extraversion, 0.66 as opposed to 0.68 for agreeableness and 0.81 for conscientiousness. However, for neuroticism the manual reported reliability coefficients of 0.86, with calculated reliability coefficients totalling no more than 0.77. In this regard, however, it should be noted that George and Mallery (2003) are of the opinion that 0.77 may be regarded as an acceptable reliability coefficient. Apart from neuroticism, the most notable variance relates to openness to experience, where the manual reports a reliability coefficient of 0.73 with a calculated reliability coefficient of 0.58. Here, however, it should be noted that criticism against the NEO-FFI mostly concerns the way in which openness to experience is measured. In fact, McCrae and Allik (2002) pointed out that a great deal of variance exists regarding clinical evaluation of this personality domain, implying that any reported detail will have to be re-examined. Despite the criticism of NEO-FFI's measure of openness to experience, results arising from this study may be regarded as a reliable and valid measure of the personalities of those student teachers who participated. The NEO-FFI was administered on all 835 fulltime student teachers who attended compulsory education modules on a particular day. Participation was voluntary, and commenced only after student teachers had given their informed consent, and had the opportunity to ask any relevant questions and to have them addressed to their satisfaction. On completion of collection, data were captured, the NEO-FFI profiles were scored, and descriptive and inferential statistics were calculated. The descriptive statistics included mean scores, averages, standard deviations, frequencies and percentages, while the inferential statistics referred to aspects such as reliability, validity and statistical and/or practical significant differences in terms of biographical variables. The biographical variables included gender, academic year and phase of training. Ethical clearance was obtained from the Ethics Committee of the North-West University before commencing the research. Participation was voluntary and informed consent forms were completed before data collection. Anonymity and confidentiality were maintained at all times and participants were protected against any form of physical and/or emotional harm. Participants were free to withdraw from the research at any time during the course of data collection without fearing prejudice or implications for their formal academic assessments. The NEO-FFI was purchased, administered and interpreted by a registered psychologist in accordance with the rules and guidelines set out in the manual. The study population includes students who were present during the administration of the personality questionnaire and consisted of 835 participants, of whom 663 were females and 172 males. Table 2 includes a summary of the biographic information. The personality profile of the student teachers as a group was determined, as well as the personality profiles of the participants according to gender, academic year and phase of training. The norm tables in the NEO-FFI manual (Costa & McCrae, 1989, 1992; McCrae & Costa, 2010) were consulted and on the basis thereof interpretation guidelines for NEO-FFI raw scores were compiled by the authors as presented in Table 3. These guidelines may be consulted during the interpretation of the results presented in Table 2. In terms of neuroticism, a mean raw score of 23.25 was obtained, which is indicative of an average score, while a more preferred score is low. 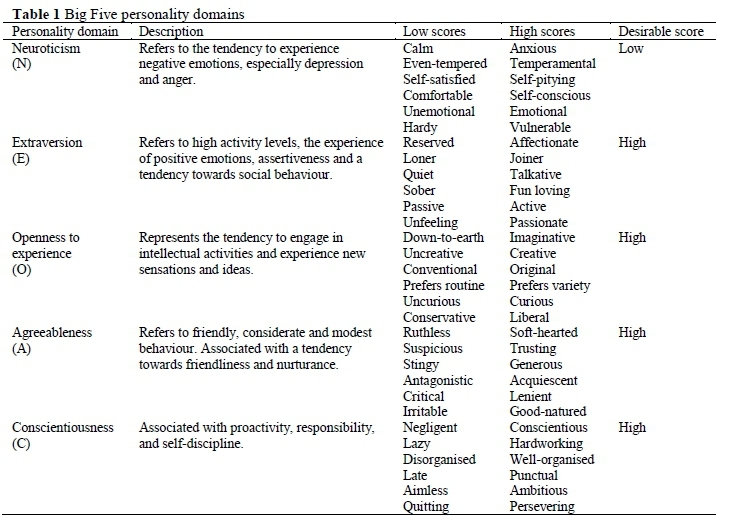 This implies that the group obtained higher than desired scores in terms of this personality domain. The mean raw score of 31.12 obtained on extraversion is a high score, which is preferable. On openness to experience, a mean raw score of 24.28 was obtained, which is indicative of an average score, while a high score is more desirable. The group thus obtained lower than desired scores in terms of openness to experience. Agreeableness yielded a mean raw score of 29.77, which is a low score, while a high score is desirable. For conscientiousness, a mean raw score of 33.15 was obtained, which is indicative of an average score; while the desired score is a high score. The group thus obtained lower than desirable scores on conscientiousness. 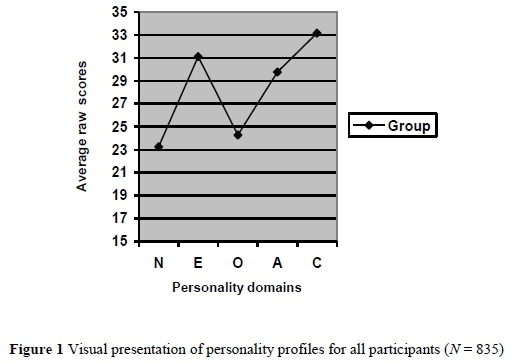 A visual presentation of the personality profile obtained for the study population, as a group, is presented in Figure 1. In order to determine the relationship between biographical variables and the personality profiles of the participants, t-tests and analysis of variance (ANOVAs) were used to determine the statistical and/or practical significance of differences as far as the personality domains were concerned. T-tests were calculated for gender and the results are presented in Table 4. ANOVAs were calculated where more than two variables were present, namely academic year and phase of training, and the results are presented in Table 5 and Table 6. In terms of gender, a practical significance with a medium effect (d = 0.5) was found between male and female participants in agreeableness, where female participants obtained significantly higher mean raw scores (x = 30.37) than their male counterparts (x = 27.43). No other practically significant differences were reported for any of the other biographical variables. 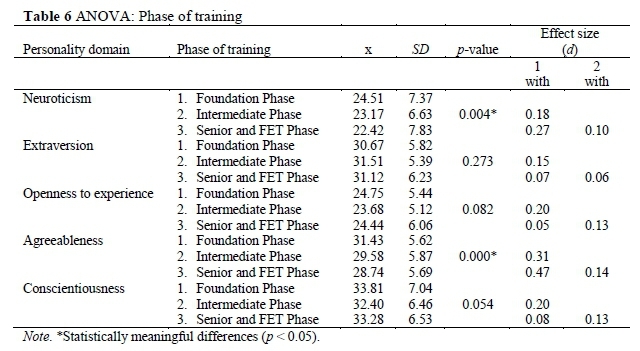 The results indicate no practically significant differences in student teachers' personality domains in terms of their phase of training and academic year, confirming that personality structure becomes fixed at 18 years and that specific traits that manifested in student teachers could be expected when they enter their professional work environment (Decker & Rimm-Kaufman, 2008; Henoch, Klusmann, Lüdtke & Trautwein, 2015; Jamil et al., 2012; Leigh, 2010; Navidinia, Ghazanfari & Zangooei, 2015; Nye et al., 2004; Ripski et al., 2011; Rivkin et al., 2005; Robbins et al., 2001; Rockoff et al., 2008; Sanderson & Kelley, 2014; Wiens & Ruday, 2014). The student teachers in this study presented with lower than expected scores on openness to experience, agreeableness and conscientiousness. A lower than preferred score on openness to experience implies a prospective group of teachers with a personality trait of being unthinking, unintelligent, unobservant and lacking imagination (McCrae & Costa, 2010; Pawlowska et al., 2014). A higher score in teachers, however, is predictive of an intellectual, introspective, futuristic, perspective taking, philosophical, creative and innovative trait (Chamorro-Premuzic, 2014; McCrae & Costa, 2010). For obvious reasons, teachers with this type of trait would be a much better fit with the dynamic nature of developing individuals and a changing educational landscape. Conscientiousness as a personality dimension scored as average in this study, whereas a high score is preferable; indicative of orderliness, being systematic, succinct, firm, hardworking, selective, self-disciplined, reliant, trustworthy, perfectionistic, precise, productive, thorough and responsible (McCrae & Costa, 2010; Pawlowska et al., 2014). The most noticeable finding was in relation to the personality trait of agreeableness, where a much lower than expected score was presented. Agreeableness describes prospective teachers' trait to be accommodating, collaborative, patient, helpful, calm, reasonable, loving, compassionate, diplomatic and polite (Chamorro-Premuzic, 2014; Pawlowska et al., 2014). A low score suggests the opposite, with clear indications of a teacher-educational context-misfit. Prospective student teachers with this personality trait have a tendency to be hostile, to bicker, and to be unsympathetic, domineering, taxing, disrespectful, dismissive, uncaring and manipulative. These qualities are counterproductive to the goals of quality education (Department of Basic Education, Republic of South Africa, 2014; Kitching, Roos & Ferreira, 2012; Magare, Kitching & Roos, 2010). A finding that give rise to concern is that higher than expected scores were presented on the personality trait of neuroticism, whereas lower scores are desired. A higher score is indicative of people with a tendency to be defensive and to create unsafe interpersonal spaces, and who are negativistic, self-pitiful, anxious, nervous, temperamental, emotionally unstable, jealous, and too sensitive, and who critique themselves (McCrae & Costa, 2010). Given the different developmental challenges that learners throughout different life stages need to master, having to deal with teachers with this trait creates an additional and unnecessary demand on learners (Sanderson & Kelley, 2014; Wiens & Ruday, 2014). In this baseline study, the only desirable personality trait that presented was extraversion. The high score indicated student teachers with a personality trait that can be described as being extrovert, tuned in on the 'herd,' pleasant, talkative, expressive, verbal, active, energetic and powerful (McCrae & Costa, 2010; Pawlowska et al., 2014). Teachers with this kind of trait show a promising optimal fit with the educational environment. Interestingly, practically significant differences were found in the personality domain of agreeableness with regard to student teachers' gender. The finding that female student teachers usually presented with higher mean raw scores on agreeableness than their male counterparts was found in this study and confirmed in literature (Costa, Terracciano & McCrae, 2001; Rubinstein, 2005; Weisberg, DeYoung & Hirsh, 2011). Possible explanations offered are that women might display more warmth and empathy, with a greater tendency to be compassionate and to invest emotionally in others (Weisberg et al., 2011). According to Costa et al. (2001), women are more trusting and compliant. The implication of this finding, in the context of the teaching profession, is that women might be more motivated than men to maintain social and emotional bonds with learners and colleagues (Weisberg et al., 2011). This research was conducted in a specific tertiary education context, which may limit the generalisation of the findings. Furthermore, the absence of a control group and an experimental group restricted the methods of statistical analysis that could have been conducted, particularly those pertaining to the calculation of norms and in determining the fit between the empirically obtained personality profiles. It is recommended that future research should seek to identify norms for the NEO-FFI in the South African context. Future research could also determine the usefulness of personality measures in the selection of student teachers in order to arrive at an optimal personenvironment fit. One of the avenues by which to achieve the Department of Basic Education in South Africa's objective of quality education for all is by selecting and training prospective teachers who are appropriately suited to an educational setting. This baseline study indicated that not all student teachers possess personality traits for an optimal person-environment fit. On the contrary, certain personality traits seem to be contra-indicative to achieving the goal of providing quality education for developing individuals. By using a personality assessment, the selection process of prospective teachers can initiate change processes in the broader educational system. In this regard, the NEO-FFI could potentially serve as a selection instrument for student teachers because the Five-Factor Model of Personality is appropriate across different cultural contexts. i . Published under a Creative Commons Attribution Licence.